It's difficult to say what exactly has renewed the interest of the Andaman and Nicobar (A&N) administration in the contro versial crop: Centre’s strive to attain self-sufficiency in palm oil and thereby minimise foreign currency expenditure, or the administration’s own short-sightedness. In January, wielding a report on feasibility of the crop in the islands, the administration has approached the Supreme Court to revoke its 16-year-old ban on monoculture plantations in the fragile ecosystem. In May 2002, responding to a petition by three non-profits that sought protection to the archipe lago’s vulnerable indigenous comm unities and its unique tropical rainforests, the apex court had said: “There should be no expansion of monoculture or commercial plantations on Forest Land. The existing plantations of oil palm, rubber and teak are reportedly no longer viable and should be phased out.” The land so released should be regenerated to bring the area to its natural profile and that no exotic species should be introduced into the islands, it stated. While the area under oil palm has not increased beyond 1,593 hectares since the court order, the administration’s recent interest in the crop appears to have been piqued by the Union government. In 2014, soon after the Bharatiya Janata Party (BJP)-led National Democratic Alliance government came to power at the Centre, Union minister and BJP leader Nitin Gadkari visited the archipelago and urged the authorities to reconsider oil palm. To drive home the point, he said the region experiences hot and humid tropical climate similar to Malaysia and Indonesia, which have become world leaders in palm oil. The idea was reportedly mooted again at the meeting on oil palm promotion policy held at the Prime Minister’s Office on July 9, 2018. A few weeks later, a delegation visited the archipelago and the union territory’s agriculture department sent a request to the Indian Institute of Oil Palm Research (IIOPR), Pedavegi, to assess suitability of oil palm in the islands. IIOPR scientists visited five islands—Little Andaman and Bara- tang, located on the Andaman chain of islands, and Kamorta, Katchal and Teressa, scattered further south in the Bay of Bengal as part of the Nicobar islands. They submitted their report in December 2018, which says “locality factors, specifically climatic and edaphic (relating to soil) parameters are congenial in the islands for the growth of oil palms”. Experts and community leaders, however, question the validity of the report. A thorough study of IIOPR’s feasibility report shows that the team has assessed several parameters, ranging from geographical setting and land use pattern to socio-economic conditions of the farmers. But there is no mention of the impact of plantations on the islands’ unique ecology and vulnerable communities, which was at the heart of the Supreme Court’s order. In fact, the impact of monoculture plantations on the islands has been the bone of contention since oil palm was introduced in the archipelago some 40 years ago. In 1979, the agriculture department of the union territory sanctioned the first oil palm plantation project over 2,400 ha in Little Andaman and asked the Andaman and Nicobar Islands Forest Plantation and Development Corporation (ANIFPDC) to implement it in a phased manner (see ‘Contentious journey’). The project was abandoned mid-way as in 1986 the Union Ministry of Environment and Forests (now renamed the Ministry of Environment, Forest and Climate Change) imposed a ban on extending the plantation pending studies on its impact on environment and ecology. Not much information is available to understand if assessments were done to estimate the impact of oil palm plantations on the island ecology. In the following years, studies by the Central Agricultural Research Institute (CARI), established in Port Blair to develop island agriculture production technologies, however, revealed some serious implications of the plantation. Its 1987 report, submitted to the then Island Development Authority, says it takes about 15 years for different soil properties to attain a stable state after the soil cover is changed from a tropical rainforest to a crop- or plantation-based system. In 1996, CARI found an increase in rodents in the plantation areas in Little Andaman. Monoculture plantations result in the loss of soil productivity and fertility, disrupt hydrological cycles and are responsible for introducing exotic species and pests, says CARI in its report. None of these impacts find a mention in IIOPR’s feasibility report. Surprisingly, Preamble of the report notes: “During the discussions with Chief Secretary, it has been informed to the team of scientists that the A&N Administration would take care of issues relating to Supreme Court Ban and other Committee Reports with the help of Government of India.” So, was it a deliberate omission? While in Little Andaman and Bartang, the report recommends “urgent replanting” of established oil palm plantations that have crossed the economic lifespan of 30 to 35 years, it suggests introducing the plantation crop in Kamorta, Katchal and Teressa islands that are known for grasslands, flora diversity and tribal population. “The problem stems from the fact that government considers grasslands as wasteland,” says Manish Chandi, a researcher who has extensively studied the ecology of Central Nicobar. Most believe that the grasslands of Kamorta have been established by the European colonisers some 200 years ago who brought buffaloes along with them and wanted to set up dairies. But Chandi says the grasslands are endemic to the Nicobar island and have a cultural value for the tribal population who use some grass species to thatch their round huts. Agrees Christopher, secretary, Tribal Council, Teressa. “The grassland sustains the wild boar and pythons that are part of our sustenance. The streams running through them carry ample fish and prawns for us,” he adds. “The scientists (IIOPR) team did meet us and sought our opinion about converting the grasslands into oil palm plantation. We, after consultation with the community members, have decided against it as we do not want to lose our heritage,” he adds. But the report does not reflect the opinion of Christopher nor his community. 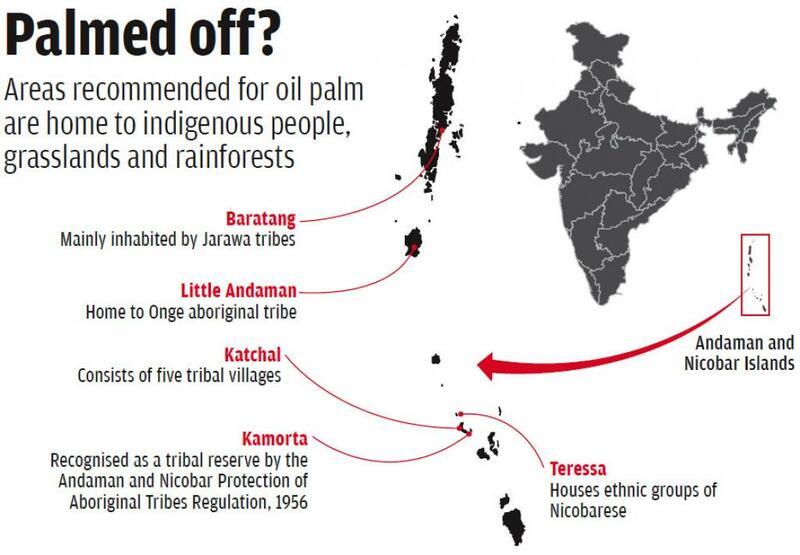 Some officials responsible for setting up oil palm plantations are also against its revival in the islands. “Little Andaman is home to two indigenous communities. Plantations may affect their natural forests and lead to resource depletion,” says a highly placed officer with the agriculture department, who did not wish to be named. In December last year, soon after IIOPR filed the report, the agriculture department forwarded it to the forest department, requesting it to divert 500 ha adjacent to the existing 1,593 ha plantation in Little Andaman. The forest department in its response in January said the existing plantation and the requested land has been formally handed over to it after ANIFPDC was closed down in 2017 following the Supreme Court order. Thus, the areas are now forest areas and diverting it for monoculture or commercial plantation shall require the review of Supreme Court’s 2002 order and clearance under the Forest Conservation Act, 1980, notes the response by a senior forest official. But the fate of the forests now depends on how the apex court reacts to the affidavit filed by the Andaman administration.